Please note: At check out you MUST check the state and the priority button prior to clicking "Proceed to Checkout". The screen will not move until this has been selected. 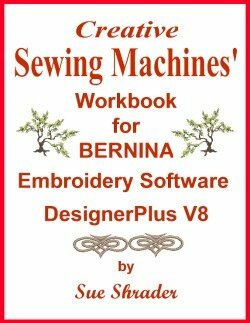 The Creative Sewing Machines’ workbook for BERNINA Embroidery Software DesignerPlus Version 8 is now complete. There are 60 lessons that cover the basics and the advanced tools that make this software the most comprehensive yet. From how to open a design with the new Embroidery Library to digitizing Cutwork, Color PhotoStitch and so much more, the workbook is sure to keep you busy for many hours. As you explore all the options available for using the software you will enjoy having an easy to follow workbook to enhance the classes you receive from your dealer. Each step of the exercises will be detailed with screen captures. This will make it easy for you to see exactly how your screen should look and keep you on track. There will be a red arrow that will point to important features as you progress through the lessons. Take each lesson in order and you will gradually build your knowledge so that by the end of the book you should be comfortable using all the tools in the software. In addition, we ask that you make note of revisions to our workbook that we are completing to reflect changes to the 8.1 update. These will be available on our website for download and for you to print at home. There will not be an 8.1 workbook, as we will continue to sell the Version 8 as it has always been and offer the replacement pages as a download. Please click here to access the revisions.